I knew I could get the baffling to be a lot flatter, in theory the thinnest it could be is the same as the material thickness. I replaced the hinges with some of these pin hinges that I've used previously. These were a bit of a faff to build but very effective at slimming the design down. These baffles fit the test tower perfectly and we very easy to remove. Way back in July I was trying to make a dice tower, there are a lot of laser cut dice towers available online and they all suffer from issues in one way or another. A lot of them use friction fits which will eventually wear down, some use expensive magnets and still take a while to set up so I started looking at my own design. A dice tower is just a box that could potentially fold flat, the only thing that stops it folding like a regular box are the baffles that the dice fall down. I built a basic box tower but made my baffles removable. When inside the box the baffles push against the sides of the box and holds the whole thing rigid. When removed the baffles fold flat alongside the box. As a concept it worked fairly well except the baffles didn't fold particularly flat which is why I carried on developing the idea rather than blogging it at the time. Ruth drew me an amazing piece of art to go on the top of my vale box, vale happened at the weekend so now I feel like I can show it off to you guys. It's done with traditional pyromancy rather than lasered but it's lovely, exactly what I wanted for the box. 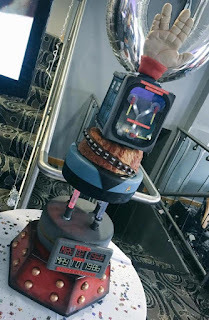 This is the cake that the flux capacitor ended up in, it takes elements from lots of scifi series and shows. There are lots more pictures over on facebook. Halfway down the cake you'll notice some coloured pillars between the layers, we realised that we could turn the transparent cake frame into mini lightsabers so I illuminated them with neopixels and made them turn on/off over time. As a very rush job last week I made a belt for the welsh regionals of colossal mania. It was last seen headed off to be painted and glued, when a photo surfaces I'll post it up here too.